UNL is a computer language that enables computers to process information and knowledge. It is designed to replicate the functions of natural languages. Using UNL, people can describe all information and knowledge conveyed by natural languages for computers. As a result, computers can intercommunicate through UNL and process information and knowledge using UNL, thus providing people with a Linguistic Infrastructure (LI) in computers and the Internet for distributing, receiving and understanding multi-lingual information. Such multilingual information can be accessed by natural languages through the UNL System. UNL, as a language for expressing information and knowledge described in natural languages, has all the components corresponding to that of a natural language. UNL expresses information and knowledge in the form of semantic network. The semantic network of the UNL is a directed graph. Its nodes are UWs or hyper-nodes (or “scope” as it is commonly called) representing concepts. Its edges are Relations between concepts. Concepts can be annotated by Attributes. Such a semantic network of the UNL is called a “UNL Expression” or “UNL Graph”. In each of <from-node> and <to-node>, a UW or a scope node is described. A UW can be followed by a <node-ID>, and a scope node is indicated by a <scope-ID> with a semicolon in front. A UNL Expression is a list of these binary relations. Universal Words are usually abbreviated to “UWs”. UWs are words of the UNL, constitute the UNL vocabulary. They are labels for concepts, syntactic and semantic units to form UNL Expressions. A combination of a set of UWs - linked with each other through relations and modified by attributes - expresses the meaning of a sentence. A headword of a UW is an English expression, a word, a compound word, a phase or a sentence of English. If the meaning of a headword is unique, the headword itself becomes a UW. Otherwise, constraints are attached to the headword to make more specific UWs. If a UW consists of a headword only, it is called a “Basic UW”. Table 1 shows examples of UWs made from “state”. state(icl>abstract thing) denotes a kind of condition that persons or things are in. This UW is defined as a more general concept that can be referred to when defining synonymous UWs conveyed by other words such as “situation” or “condition”. state(icl>government) denotes a kind of government. state(icl>region) denotes a region of a country. state(icl>governmental(mod<thing)) denotes something is under the government of a country. state(icl>official(mod<thing)) denotes something is connected with people in authority. state(icl>fix(agt>thing,obj>thing)) denotes an action to fix the details of something. state(icl>say(agt>thing,obj>thing)) denotes an action to say something. Each UW does not exist alone. They are interlinked with each other through the UW System in the UNL Ontology. As a method of defining the UWs, Master Definitions (MDs) are introduced. A MD describes all relations that a UW can hold with related UWs. Such a MD defines the concept and the label of a UW, and builds up the UW System and the UNL Ontology. In a MD, a minimum set of relations is used as constraints of UW for the purpose to make a UW distinguishable from sibling UWs. For details of MD see http://www.undl.org/publications/UW%20and%20UNLKB.htm or http://www.undl.org/unlsys/uwman2010/. There are 46 relations in the UNL, such as ‘agt’, ‘gol’, ‘obj’, etc. They are used to connect every two UWs or scopes to construct the semantic networks of UNL Expressions. The relations are edges in the UNL graphs, or functions of the directed binary relations that constitute UNL Expressions. A relation denotes a semantic role of a UW or scope (hyper UW) for others. For details of relations see http://www.undl.org/unlsys/unl/unl2005/relation.htm. Attributes are mainly for the purpose to describe subjectivity information. It includes time, aspect, emphasis, focus, topic, attitude, feeling and judgment. Attributes are also used to specify qualities of concepts such as the genericity, the specificity and the logicality of UWs. They are attached to a UW or a scope to specify the information. For details of attributes see http://www.undl.org/unlsys/unl/unl2005/attribute.htm. Table 4 shows the set of binary relations of the UNL Expression of “I can hear a dog barking outside”. Figure 1 show the UNL graph. In the UNL Expression of table 4, ‘agt’, ‘obj’ and ‘plc’ are relations. 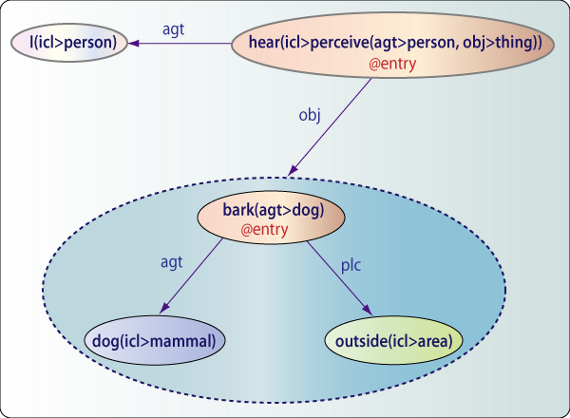 ‘I(icl>person)’, ‘hear(icl>perceive(agt>person,obj>thing))’, ‘dog(icl>mammal)’, ‘bark(agt>dog)’ and ‘outside(icl>area)’ are UWs. ‘@ability’, ‘@entry’, ‘@indef’, ‘@progress’ and ‘@topic’ are attributes. The part “a dog barking outside” is expressed in a scope, ‘01’ is assigned as a Scope-ID to the scope. Binary relations with the same Scope-ID appearing following the relation labels constitute the UNL Expression of a scope. In table 4, the fourth and the fifth lines are the binary relations of the scope ‘01’. A Scope-ID together with a colon in front (for example ‘:01’ in the third line of table 4) appearing in the position of a UW is called a scope node. A scope node is used as a way to refer to a scope. A unit of UNL Expression is a UNL Document (UNLDOC). A UNL Document is considered as a hyper-node composed of a semantic network among sentences of paragraphs. A paragraph or a sentence is a hyper-node too. A hyper-node of a paragraph is composed of a semantic network among sentences, and a hyper-node of a sentence is composed of a semantic network of UWs. The semantic network of the hyper-node of a UNL Document consists of two parts: a sequence of hyper-nodes of paragraphs or sentences of the document, and a set of semantic relations among hyper-nodes of the paragraph or sentences. A sequence of hyper-nodes can be considered as a directed (ordered) graph linked with the relation “nxt” which express the physical sequence of paragraphs or sentences. Likewise, the semantic network of a hyper-node of a paragraph also consists of two parts: a sequence of hyper-nodes of sentences or other paragraphs included in the paragraph, and a set of semantic relations among hyper-nodes of the paragraphs or sentences. The semantic network of a hyper-node of a sentence consists of a set of semantic relations between UWs. Every hyper-node of a paragraph or a sentence and UW can be referred to from any other hyper-node of a paragraph or a sentence or a UW. For details of UNLDOC see http://www.undl.org/unlsys/unl/unl2005/expression.htm. Each UW does not exist alone. They are interlinked with each other through the UW System of the UNL Ontology. The UW System is a hierarchy of UWs, established based on conceptual inclusive or property inheritable relationships between UWs. In the UW System, With ‘Universal Word’ at the top, all UWs are linked with each other through ‘icl’ (subclass of), ‘iof’ (instance of), and ‘equ’ (equivalent to). The hierarchy of the UW System is constructed with taking property inheritance and substitutability of lower UWs by super-class UWs mechanisms into consideration. In the UW System, lower UWs inherit the properties of upper UWs, and upper UWs can replace lower UWs to convey a more general sense in a specific context of the lower UWs. Both property inheritance and substitutability mechanisms are materialized for all UWs through 'icl', 'iof' and 'equ'. Substitutability of lower UWs by upper UWs can cause problems by introducing ambiguity if the upper UWs are not close in meaning to the lower UWs. To avoid this, the upper UWs must be the closest UWs among all of the more general UWs. In other word, every UW must be positioned under the closest upper UWs. The UW System allows having multiple superordinate (super class) concepts of UWs. The hierarchy of the UW System is a lattice network. A UW can inherit different sets of properties by linking it to different upper UWs that have different properties. Figure 2 shows part of the top hierarchy of the UW System. The UW System consists of four groups of UWs. Each group is comprised of binary relations though ‘icl’, ‘iof’ or ‘equ’. 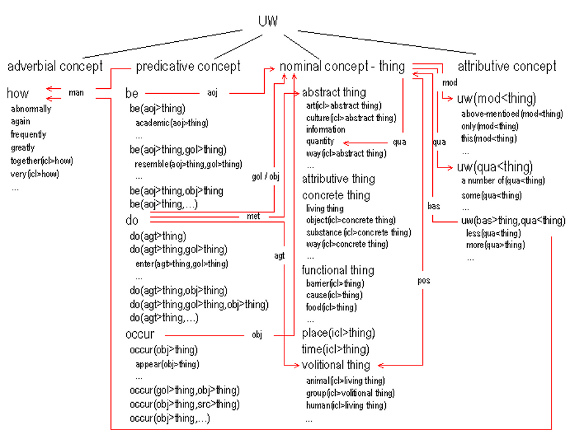 Red arrows show examples of semantic relations between the highest possible UWs (see UNL Ontology). The UNL Ontology is a semantic network comprising every directed binary relation between UWs. It consists of the UW System, possible semantic co-occurrence relations between UWs, and concept definitions of UWs. The UNL Ontology provides linguistic and semantic knowledge on concepts. This knowledge is necessary for language understanding as well as for reasoning. A UW is a label for a concept. The concept of a UW is defined by describing the set of possible relations it can have with other UWs in the UNL Ontology. The set of possible relations of a concept determine the behavior of the concept. This behavior is the property of a concept in the sense that the set of possible relations characterize the concept and provide enough information for understanding the semantic structure of a sentence when in which the concept is included. In the UNL Ontology, all possible semantic co-occurrence relations, such as 'agt', 'obj', etc, between UWs are defined based on the UW System. Every possible semantic co-occurrence relation is defined between the two most general UWs in the hierarchy of the UW System that can have the relation. With the property inheritance characteristic of the UW System, possible relations between lower UWs are deductively inferred from their upper UWs and this inference mechanism reduces the number of binary relation descriptions of the UNL Ontology. The UNL Ontology provides linguistic and semantic knowledge about UWs. 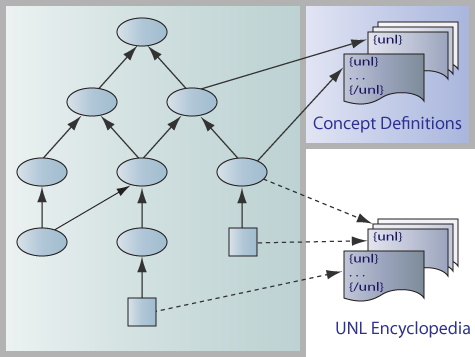 In the UNL System, the UNL Ontology is used in sentence analysis for disambiguation and in sentence generation for finding more general concepts when encountering unknown concept to a language. The UNL Ontology is also used to verify a UNL Expression. Necessary and sufficient conditions for belonging to the set (class) defined by a concept are necessary knowledge for reasoning. This knowledge is considered semantic knowledge about concepts. In the UNL Ontology, every UW is given a concept definition. A concept definition is an intensional definition of the concept, consists of by a set of binary relations that specify all the essential properties of the concept. For instance, the definition of “bachelor” is “unmarried man”, and the definition of “author” is “a person who writes books or a person who wrote a particular book”. Concept definitions are provided in the form of UNL Expressions. A UNL Expression of a concept definition is linked with correspondent UW as a hyper-node. The purpose of concept definitions is to provide knowledge of concepts in connection with other concepts that can specify the concepts. This knowledge is indispensable for reasoning in information retrieval. In figure 3 the highlighted part shows the structure of the UNL Ontology. Circles show UWs for class concepts, squares show UWs for instances. Every class concept UW is linked with its upper UWs by ‘icl’. An instance UW is linked with either a class concept UW by ‘iof’ or another instance UW by ‘pof’. Every class concept UW is provided with a concept definition. As the UNL Encyclopedia, every UW is linked with the description of knowledge about the UW in UNL. For example, a book title is linked with ‘book(icl>document)’ by ‘iof’ as an instance concept UW. The content of the book is linked with the UW of the title by ‘cnt’. In the UNL System, knowledge is considered into three levels. The first level (lighter blue part) is linguistic knowledge provided by the UW System and possible semantic co-occurrence relations. The second level (deeper green part) is the semantic knowledge provided by concept definitions. And the third level is the real world knowledge provided by a book, a homepage, etc. For details of the UNL Ontology see http://www.undl.org/unlsys/unl/unl2010/UNL Ontology.htm. Instead of natural languages, information and knowledge described in UNL not only make it possible to provide people with a Common Language Infrastructure (CLI) for distributing, receiving and understanding multilingual information through the Internet, but also make it possible to provide computers with enough knowledge in the form accessible and understandable. This Knowledge Infrastructure (KI) enables computers to make intelligent processing including reasoning. To make information and knowledge UNLized is a movement. The purpose of the UNL movement is to provide an infrastructure of information and knowledge for people to have equal opportunities to use without any language barrier and for computers to do intelligent processing using the knowledge. There are two ways to join this movement: to enter the UNL Society (UNLS) or to work as a member of the UNL Center (UNLC). The UNL Society is a group of people or organizations who are interested in R&D of UNL-related applications or language modules (e.g. language servers). Members of the UNL Society have access to the UNL resources that provided by the UNL Center and are able to receive technical consultations from the UNL Center. Members of the UNL Center will enhance the UNL itself and UNL System for adoption in various fields of information and knowledge and extend the coverage of languages linked with the UNL. The UNL was introduced to the public for the first time in November 1999, in the book A Gift for a Millennium, which was published under the auspices of the Institute of Advanced Studies (IAS) of the United Nations University (UNU), in Tokyo. That forerunner publication described the general idea of the UNL and its first version specifications, and presented the embryo of the UNL System with all its constituent elements. Later in the second version UNL book published in 2005, they are enhanced, and the practice use of UNL and the management or operation of the UNL System are included in addition. The UNL is an ambitious initiative that was launched in 1996, as a Programme of the Institute of Advanced Studies in Tokyo, Japan. From the very beginning, a global-scale network of R&D teams, involving specialists in computer science and linguistics, have been at work creating the linguistic resources and developing the software of the UNL System. Under the direction of the UNL Center, a consortium of the university department and research institutes around the world have been developing UNL Language Centers (LC) for the respective native languages. In the first ten years of work, the UNL Programme has already crossed important milestones. The overall structure of the UNL System has been developed with a set of basic software and tools necessary for the development and functioning of the UNL. A vast amount of linguistic resources of the UNL as well as the various native languages has been accumulated in the last few years. Moreover, the technical infrastructure for expanding these resources is already in place, thus facilitating the participation of many more languages in the UNL System from now on. In recent years, UNL-based applications have been gradually developed. The purposes of current UNL-based applications are mainly to provide intelligent search of information utilizing UNL technology and infrastructure, to assist or guide people in creating or improving UNL environment, to facilitate use of UNLized information and technology, etc. Those applications are already ready for people to experience. In January 2001, the United Nations University set up an autonomous organization, the UNDL Foundation, to be responsible for the development and management of the UNL Programme. The Foundation, a non-profit international organization based in Geneva, Switzerland, inherited from the UNU/IAS the mandate implementing the UNL Programme and of bringing it to fulfill its mission. The UNL remains a long term endeavor, and invites a broad participation of people from all languages. The beauty of the UNL development is that it is designed as modular and open endeavor, in which many people can work together, individually or in teams. It is accessible to all languages, with all their variations. To benefit from it, it is required to develop the linguistic resources, such as dictionaries, and the enconveting and deconverting rules for the natural language. The manuals and instruments necessary to undertake the work are provided in UNL book and UNL website (www.undl.org). The UNL is the property of the United Nations and, therefore, a patrimony of all of human being. Four patent applications have been registered in the name of the United Nations. The applications went successfully through the Patent Co-operation Treaty (PCT) process concluded in 2002. These two patents have been granted by the USA in 2004 and 2006 (patent numbers 6,704,700 and 7,107,206), and one of them has been granted by Chine in 2006 (patent number ZL00817887.9) and by Japanese in 2009 (patent number 4377096). The United Nations and the UNDL Foundation signed an agreement, in which the Foundation is granted with the responsibility and the rights of continuing developing, promoting and protecting the UNL as asset of all nations.